Maybe the short and sweet, not to mention terrifically entertaining battle 130-pounders Juan Manuel Lopez and Daniel Ponce de Leon gave us this year should win the slugfest of the year distinction. Both men, their careers quite literally on the line, swapped leather, and traded knockdowns, in a manner befitting two prizefighters with everything on the line. You may have other fights in mind as your choice or choices for 2014’s FOTY, but lovers of a dramatic, hi-octane rumble with swiftly shifting momentums and a ton of fierce leather exchanged in just a handful of minutes will show as much affection and appreciation to this one as I do. Going into the rematch of their initial fight, won by Lopez via quick stoppage way back in 2008, we knew super-featherweights Lopez and De Leon would exchange bombs in a can’t miss fight. 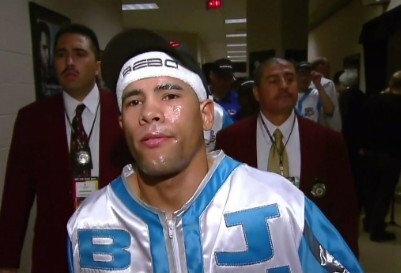 And in “Juanma’s” homeland of Puerto Rico in March, on a card that was headlined by Danny Garcia’s controversial points win over a determined Mauricio Herrera, we saw a blisteringly exciting battle that was capable of speeding uo many a fight fan’s heartbeat. Back in 2008, a new star burst onto the world stage down at super-bantamweight, as Lopez iced defending WBO boss De Leon inside a round. A lot had happened to both power punching fighters since, and the rematch, up at 130-pounds, was largely seen as the last roll of the dice for both men, Lopez especially. Many experts, including Lopez’ former promoter Bob Arum, openly called for Juanma’s retirement after his TKO loss to Mikey Garcia last year. De Leon was also looked at as a fine fighter who had seen better days, yet he was deemed to have had more left than his fellow southpaw. What went down in the return meeting was something quite special that could perhaps have been ever more special had the referee not made the debatable decision to dive in and call a halt to proceedings when he did. The opening round saw De Leon hold an edge in speed and accuracy. Both men wasted no time in looking for a fight-ender, and the bombs were being loaded up on already. Then, in the 2nd-round, the lid of the fireworks box was well and truly removed. De Leon scored first, hurting Lopez with a left to the head that discombobulated Lopez and forced him to touch the canvas with his glove. De Leon went for the finish as soon as battle recommenced and was made to pay for his eagerness to end matters. A cracking right hand counter smashed into the Mexican’s head and he went down on his back in spectacular fashion. It looked for a second or so that the fight was over, with Lopez having come back from certain defeat. But De Leon got back up and fought on. Lopez scored a second knockdown, but this time it seemed as though De Leon was bundled over, although he had been tagged by another shot upstairs. De Leon looked stunned yet he was not “gone” by any means. But Lopez went in for the kill, pinned his man on the ropes and let loose with both hands. De Leon, still trying to throw punches back at the time, found the referee’s arms wrapped around him, the fight over. Instantly, De Leon signalled to the crowd that he was fine and that the stoppage was a bad call. It did look as though De Leon had a reasonably clear head. Still, betting underdog Lopez didn’t care about any of that and began celebrating in front of his hometown fans. His career resurrected, at least partially, Lopez – a slugger who may go down in history as one of the most consistently thrilling fighters of his era – proved once again how his withering power and his big heart would always make him a threat in any fight. Since their March slugfest, neither guy enjoyed any further success. De Leon – after a stoppage loss in June – quit the ring and opened a gym, while Lopez was brutally stopped in his subsequent outings; the two losses almost certainly signalling the end of his career. It could certainly be argued, though, how both fighters went out with a bang.